For only P500 (kid) and P1, 000 (adult) entrance fees, get to discover Marriott Manila’s phenomenal Easter party which has been packed and full for two years straight. 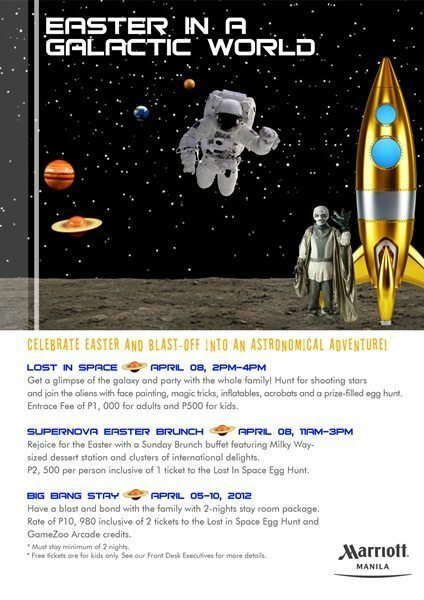 Hunt for shooting stars and join the aliens for an afternoon of face painting, magic tricks, and games. 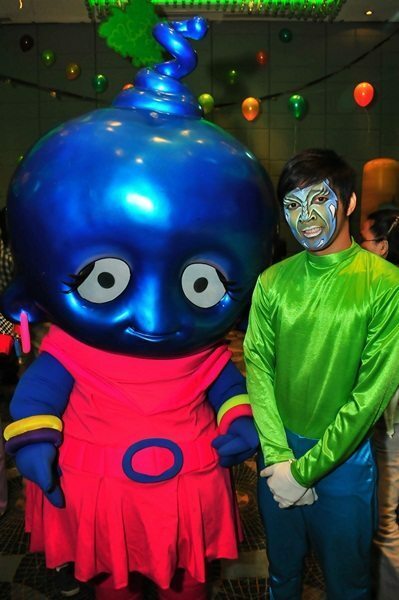 Plus, there are also inflatables, acrobats and the most-awaited egg hunt that all kids are surely looking forward to. Aside from these, we pump up the thrill with an exciting line up of lip smacking snack sampling from Kroketten, the crunchy and healthy Danish potato balls with Pinoy twist. Aside from this, Jack and Jill are also giving away their most-loved products from chips to cookies! If the games and activities will make you feel dry, Fruit Magic has a thirst-quenching booth of fresh fruit juices. Plus it doesn’t end there. If you fancy heavy and filling afternoon snacks and finger food, the buffet station offers sensual varieties the whole family will surely drool over. This Easter, executive chef Meik Brammer sweeps off everyone’s feet with his long list of menu: ham and cheese finger sandwich, tuna sandwich in sesame bun, pop corns, fried chicken wings with barbeque sauce, vegetable fried rice with shredded egg, macaroni cheese, mini pizza, colorful cup cakes, cookies, fruits, and chocolate fountain with condiments. While the entrance is affordable, the party brings the fun and delicious afternoon 5-star experience of Marriott Manila. From the service, program, and menu–no one will ever feel shortchanged. An inviting beacon set in the world-class casino entertainment complex of Resorts World Manila, Marriott Hotel Manila is the place to work and play. Ideally located in Newport City across Ninoy Aquino International Airport Terminal 3, it is a convenient 15 minute drive from Makati Business District and Bonifacio Global City. Affording a splendid view of the adjoining 18-hole Villamor Golf Course, it boasts 342 exquisite guest accommodations that offers luxurious bedding, in-room safe, mini-bar, high-speed Internet, air conditioning, 40″ full high definition LCDs with IPTV, videos on demand and jack pack plug-and-play system. 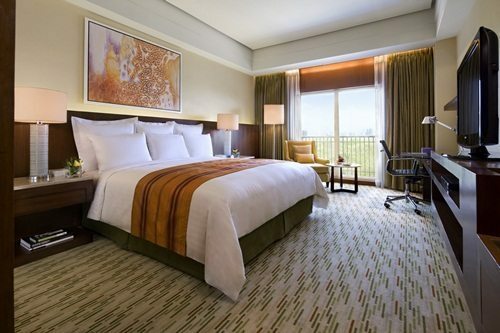 The hotel features excellent dining options such as Marriott Cafe, Cru Steakhouse, Java+ and Lobby Lounge. Leisure facilities include Quan Spa, Health Club, Salon and Newport Mall. With a Grand Ballroom and several meeting rooms, Marriott Hotel Manila is also the ultimate destination for meetings and events, from weddings to gala dinner celebrations.